Beautiful! It's such a simple and classic piece. Clamp works great, in marvelous condition. Packaged well and arrived fast. Very attractive doily assortment, Thanks! New in Auntlillysattic. 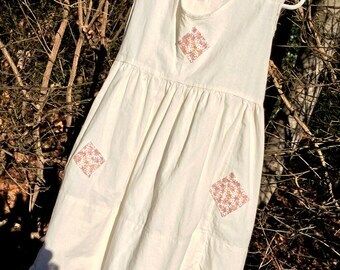 A selection of vintage toddler/infant summer white dresses. New in the shop. Natural dye techniques using vintage linen. Five different laces just added. Come take a look. It is my goal to offer beautiful things for sale and to have satisfied customers. Your feedback on merchandise and service is always appreciated. If you are unhappy with your order, please return it within 5 days of receipt in its original condition. I will gladly refund the price of the item minus shipping costs once I receive the item. I CAN SHIP INTERNATIONALLY but need your location to accurate calculate First Class postage. Please contact me so I can calculate shipping and post the charge for your location. I ship within the United States using USPS as soon as each method of payment has cleared. If you would like insurance, please convo me and we can work out the details. If shipping costs are less than posted, I refund the difference.